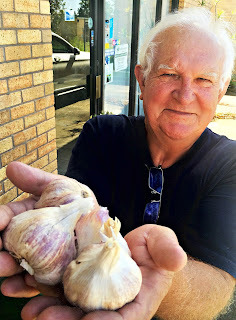 Some great news: Barrington River Organic Farm is proud to announce that we have won GOLD at the prestigious Royal Melbourne Fine Food Awards in the category of “Organic Hard Neck Garlic (Fresh Produce)”. From our Press Release: "This award is a testament to the hard work, focus and determination of biodynamic farmer, Jan Goroncy and his team at Barrington River Organic Farm. “I am completely chuffed to win this award, because it validates my instincts as a “foodie” as well as my skills as a farmer. It was my good fortune to have encountered this beautiful organic Hard Neck garlic at a market stall some years ago – I fell in love with it immediately, and managed to obtain some seed stock to grow it. There was no specific training available for growing this variety, so I had to draw on my experience in biodynamics, my intuition, my endless research, and my passion for farming the best quality food, to achieve this fantastic outcome,” he said.